It's the handiwork of our old friend the Larvacea. Look at him there, ain't he cute? Sort of? In a way? Larvaceans are one of those crazy chordates that don't think a backbone is all it's cracked up to be. 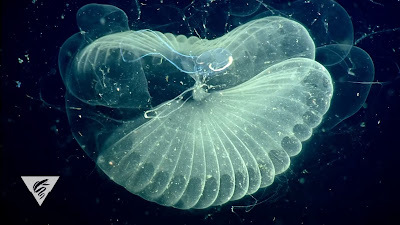 All of us vertebrates are chordates - whether we're mammals, reptiles, birds, amphibians or fish - but so are sea squirts (jugs on the seabed), salps (swimming tubes) and lancelets (living fish fillets). Larvaceans even get their name from their similarity to larval sea squirts. 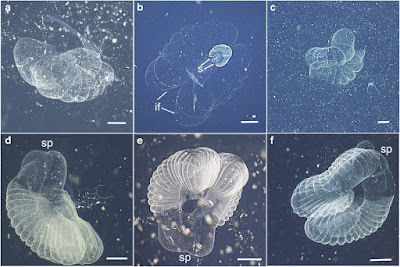 But, while sea squirts grow up into a kind of jug firmly attached to the seabed, Larvaceans look something like a tadpole for their entire lives. But Larvaceans are home-makers! They construct rather lovely, expressionist structures known as 'houses' which they live in. There's not much building material in the open sea, so in lieu of any handy bricks or planks of wood, they make their house entirely out of mucus. Hey, it's a renewable resource. The Larvacean lives in the heart of its house, surrounded by corridors and pathways that channel the flow of water. The house can be as much as 2 metres (6.5 ft) across, with outer walls that act as sieves (or a white, picket fence) to filter out large bits of detritus. The Larvacea lives in an inner sanctum. The walls here are even finer sieves that filter out anything too large for the home-owner to eat. Most Larvaceans are only a centimetre (half an inch) or so long. 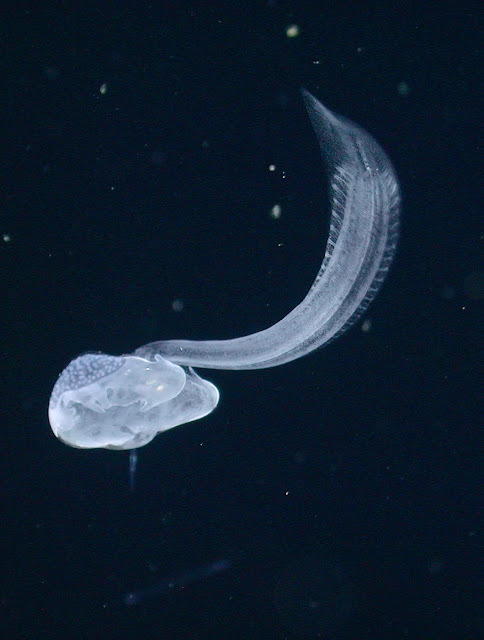 However, even when it comes to tadpoles, the deep sea doesn't disappoint. Giant Larvaceans can reach as much 9 cm (3.5 in) long! They have names like Bathochordaeus charon, which was first discovered in 1900 and wasn't seen again until 2016, and is named after Charon, the famous ferryman who carries souls across the River Styx. There's B. stygius, named, would you believe it, after the River Styx. And then there's the recently discovered B. mcnutti, which I guess is named after some guy called McNutt. I'm sure he's lovely and in no way closely associated with death. Maybe he just has a perpetual cold and produces enough mucus to make a house? I like the way you have explained theses organisms in an easy way to understand. The photographs are also elaborative and detailed, thanks for sharing. WOW! Feels a bit reapetetive to say that again, but what can I say? Beautiful and amazing! Again! That's nature for you, constantly incredible!